This is a short read to summarize the meta strategy in simple terms for individual investors who are interested in a sophisticated, low maintenance tool to build active portfolios. It is called „meta“, because it is a portfolio allocation method, that can be used for many different types of investment strategies – I describe one possible implementation, using broad asset class ETF, in this article. The ETF strategy aims to earn the same returns as the stock market, but with only half the maximum losses from the peaks over the long term, by rotating between five different Exchange Traded Funds (ETF), representing the major asset classes, and cash. A more aggressive version, for investors who can stomach the risk of drawdowns as high as we have seen in the stock market in the past, aims for returns that are about 50% higher than the stock market´s over the long term. 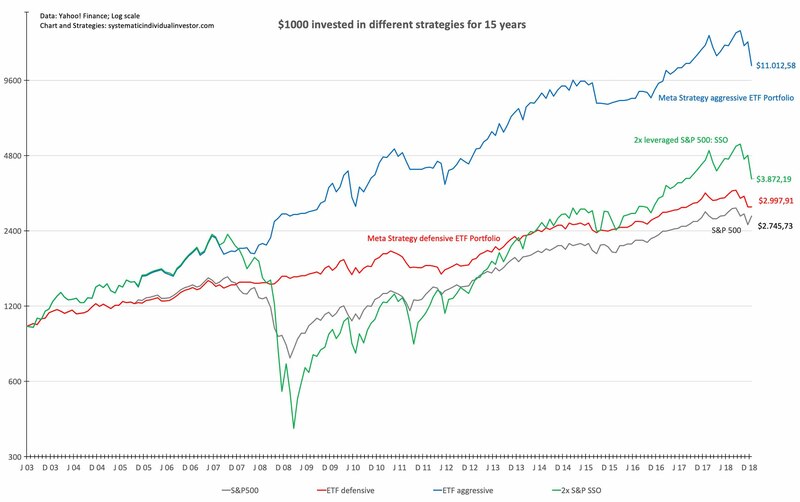 Should our model portfolios manage to achieve this (see backtests below for their historical performance), they will beat the vast majority of all active funds and wealth managers. If you think this is a great idea you can dive into the details, which will enable you to tweak and use the strategy independently, starting here. Or you can simply follow how I invest according to the strategy in my own portfolio by subscribing to my newsletter here – it includes a defensive and an aggressive ETF model portfolio with all the ticker symbols and other details for US as well as EU investors. What is the Meta Strategy? The majority of the time the stock market goes up and returns more than other financial assets (for example bonds, real estate or commodities) – about 9% per year total return for the US stock market on average. But this comes with the risk of large, painful intermediate losses as we last saw in 2018 or, much more severely, in the financial crisis of 2008/09. As our default, we aim to be fully invested in the stock market and then use a systematic approach to avoid the majority of the declines of bear markets and large corrections (larger than approximately -15%) by shifting to safer assets (bonds or cash) and/or alternative assets (commodities) in time. I strongly believe, that concentrating on these long term developments and ignoring short term ups and downs as well as the constant barrage of news gives an investor the best chance to perform well. An active portfolio can help to avoid the mistakes that come with large drawdowns – often people sell in panic at exactly the wrong time, which causes them to underperform the stock market significantly. The Meta Strategy uses economic data combined with the current trend and the volatility of the stock market to determine when to reduce the allocation to stocks. This is in contrast to many well known tactical asset allocation strategies, that only use measures of trend to select which assets to invest in – the meta strategy paints a clearer picture of the market environment. Because the environment usually changes from good to bad gradually, we also change our portfolio in several small steps. Frequently investors get scared by bad news and overreact – the market drops and quickly recovers when risks are averted. We don’t want to sell everything and get back in at higher prices, whenever this happens. On the other hand, the protection of our capital against the infrequent large market declines is our primary concern – the strategy uses systematic measures to determine when to take a market drop seriously and move into a defensive position. In previous articles, I laid out the evidence, that many economic and technical indicators enable us to avoid major market declines without changing long term returns very much. Through many tests, on data going back to the 1950s, I figured out which signals to trust most – each single warning is very simple and has worked over a long history all by itself. But because each indicator has its disadvantages, I combine several to get a clear, nuanced idea of the state of the market. This combination of fundamental data and technical models is what sets the Meta Strategy apart. To visualize the resulting signals, I use a traffic light analogy: a green light gives the go-ahead, yellow tells us to be careful and the red light moves us to the sidelines, because bad things are likely to happen. Economic conditions and technical signals each have their own traffic light and complement each other. Leading economic indicators give us a good idea of the economic development, but are not very good at timing the actual price movements – we use them to be more or less sensitive to the price changes we see. Technical indicators, based on these price changes, give us the exact timing signal. Because these timing signals are often false warnings, we want to see stronger signals when economic conditions are good and will react to more sensitive warnings when the economy is in trouble. In the worst case, if economic indicators failed to signal deteriorating conditions, the strongest technical warning signals serve as a stop loss to protect our capital. Starting in January 2019 I will track two model portfolios, that I invest in with my own money (I use the aggressive version). It is a good time to start as the strategy is 100% in cash since December 2018 – a rare occurrence, since for the first time in 70 years all major asset classes showed year-over-year losses at the same time. If you are interested in following the progress of these portfolios or simply want to support my work, producing high quality content available for free, I would love for you to subscribe to my monthly newsletter “The Meta Strategy ETF Portfolio”. I will be happy to email you the current edition as a sample, if you send me a short request via email (I won’t use your data any further). The defensive portfolio invests long-only in regular broad asset class ETF or cash. The aggressive portfolio uses 2x leveraged equity ETF (returns are likely to be higher, but drawdowns will double as well) and is allowed to use inverse equity ETF (that have positive returns, when the market goes down) in the worst market conditions. A 15-year backtest of the Meta Strategy Defensive (red) and Aggressive (blue) ETF Portfolio (click chart to enlarge) shows the advantages distinctly: Losses in the worst bear markets are reduced, while overall returns are improved in the defensive ETF portfolio. The strategy earned about 1% more annually than a buy and hold investment in the S&P 500 (grey) and the ride was a lot smoother, avoiding the sleepless nights of 2008/09. These lower drawdowns make a responsible use of leveraged and inverse ETF possible. The aggressive strategy (blue) more than doubled the annual return of a buy and hold investment in the S&P 500 with fewer than two allocation changes per year – 16,70% vs 6,73% leading to 3,6x more money over the 15 year period (not including dividends or transaction costs). For comparison I included the performance of a buy and hold investment in a 2x leveraged S&P 500 ETF (green): here the lethal properties of untamed leverage become apparent – a 83% drawdown in 2008/09. Impossible to tolerate for virtually anyone, even though it did lead to higher returns than the S&P 500 over the long run. Backtested results are hypothetical, are NOT an indicator of future performance. For an in-depth description of the meta strategy, including all the indicators I use and different ideas for implementing it with different portfolio strategies, start reading here.